A blogger was so inspired by the message behind Beyoncé's "***Flawless" video, she made her own version celebrating body positivity and acceptance. As a fat woman of color, I'm often treated differently than my thin, white peers. By brands, by fellow bloggers, by the media... I get passed over for things I'm more than qualified for. I get stares and cold shoulders at fashion events. I hear whispers. I get hate mail and trolling comments from people who call me disgusting and say I shouldn't be allowed in public. Like Bey, I usually just brush these people off, and I never give these people power by addressing them here or anywhere else. But it gets tiring, and sometimes I'm really tempted to drop the lady-like thing and just kind of...go off. 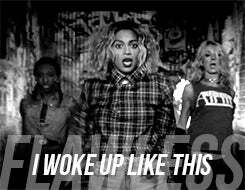 So when I heard Beyonce addressing her haters in the song ***Flawless, I immediately fell in love. Watch the video below and check out more from Gabi on her website.